As is known from earlier studies, the monsoon rainfall is not continuous and is punctuated by active and break cycles (Goswami, 2005). Satellite observations have revealed that the active and break of south Asian monsoon or the wet and dry spells over the Indian continent, are manifestation of repeated northward propagation of the tropical convergence zone from the equatorial position to the continental position [Sikka and Gadgil, 1980; Yasunari, 1979] and results from superposition of a 10-20 day and a 30-60 day oscillations. Both the 10-20 day oscillation and the 30-60 day oscillation contribute roughly equally to the total intra-seasonal variability (ISV) in the south Asian monsoon region. While 30-60 day oscillation has a very large zonal scale encompassing both the south Asia and the East Asia/West north Pacific monsoon regions, the 10-20 day oscillation has a smaller zonal scale and is regional in character. The 30-60 day mode is characterized by a northward propagation while the 10-20 day mode is characterized by a westward propagation. It indicates that relative frequency of occurrence of active and break phases could influence the seasonal mean and contribute to the inter-annual variability (IAV) of the SAM. The amplitude of intra-seasonal variability (ISV) of ISM is very large and represents a large signal and hence is likely to have large potential predictability. While the amplitude of inter-annual variability (IAV) of ISM rainfall over relatively smaller spatial scale is about 20% of the mean, the amplitude of ISV of rainfall is as large as the mean (Goswami et al. 2011, book chapter, ed. C. P. Chang). Several studies (Goswami and Xavier, 2003, Waliser et al. 2003) have made estimate of potential predictability of monsoon ISO's to be about 25 days (Fig.4). This knowledge prompted many studies to attempt to develop techniques for predicting Indian summer monsoon ISV. The skillful and timely forecasts of intra-seasonal monsoon rainfall possess a greater potential utility for agriculture and water resource management (Goswami, 2005). There have been several important research studies in the recent past using both statistical and dynamical methods for the extended‐range prediction of the Indian summer monsoon intra-seasonal oscillation (ISO) and its active and break spells. Lo and Hendon , Mo  and Jones et al. used statistical techniques for the skillful long‐range prediction of the Madden‐Julian Oscillations. Goswami and Xavier  used an empirical model for the prediction of intra-seasonal monsoon breaks 18 days in advance. Webster and Hoyos  used wavelet banding to develop a prediction scheme for the prediction of intra-seasonal rainfall and river discharge on 15–30 days timescales. Using the insight gained from nonlinear dynamical system theory Dwivedi et al. developed an empirical rule for the extended range prediction of duration of Indian summer monsoon breaks. Dwivedi and Mittal  forecasted the duration of active and break spells in Intrinsic Mode Functions of ISOs. 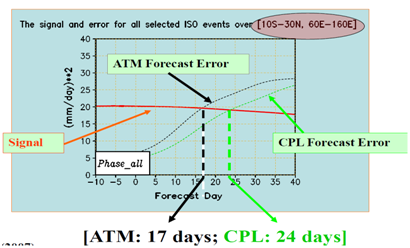 Xavier and Goswami  used analogue technique for real time forecasting of ISOs. Waliser et al. estimated the limit of dynamical predictability for the tropical ISO using an atmospheric general circulation model. They also explored the influence of strength and phase of the ISO on the predictability limit. The impact of air‐sea coupling on the predictability of ISO has been investigated with an atmosphere‐ocean coupled model and its atmospheric component by Fu et al. . Fu et al  have noticed that ISO prediction using coupled models was improved by 5 days (Fig. 4). Fu et al. examined the sensitivity of monsoon intra-seasonal forecasting to different initial conditions using coupled model. An attempt was made to develop a statistical technique using the Artificial Intelligence (AI) for the very long‐range prediction of the ISO data. The Genetic Algorithm (GA) and Artificial Neural Network (ANN) are used as AI models for this purpose. In a recent study, Chattopadhyay et al., (2008) have shown the ability of Self Organizing Maps (SOM) technique to isolate spatial structure and evolutionary history of nonlinear convectively coupled states of the summer monsoon ISO. This knowledge is used to develop an analog technique for predicting different phases of monsoon ISO. Skillful four-pentad lead prediction of rainfall over central India is demonstrated with the model using only large-scale circulation fields. A major strength of the model is that it can easily be used for real-time extended-range prediction of monsoons. Several studies (Sengupta et al. 2001, Fu et al. 2003) have demonstrated that ocean-atmosphere interaction plays a crucial role in defining the space-time spectra of summer monsoon intra-seasonal oscillations (MISO). Using a coupled model Fu et al., (2007) have shown that the MISO predictability is generally higher over the Indian sector than that over the western Pacific with a maximum of 35 days in the eastern equatorial Indian Ocean. Air–sea coupling significantly improves the predictability in almost the entire Asian–western Pacific region. The mean predictability of the MISO-related rainfall over its active area (10°S–30°N, 60°–160°E) reaches about 24 days in the coupled model and is about 17 days in the atmosphere-only model. This result suggests that including an interactive ocean allows the MISO predictability of an atmosphere-only model to be extended by about a week.